It’s dead! It’s alive! It’s dead again! It’s been resuscitated in a profit-sharing deal with Comcast! At press time the future of CBS’s Jericho was still in flux, but its second season represents a victory for anyone who has ever been a member of a cult audience for a show that captured few viewers but a select few hearts. I’m not saying that all cult audiences like or even should like Jericho. To say it’s an acquired taste would be an understatement; it’s basically The Waltons with genocide. But the resurrection of Jericho after fans mailed tons of peanuts to CBS headquarters to tell the network they were “nuts” represents one of the only times a devoted viewership has actually saved a show they love from axe-happy studio executives. Jericho was always a tough sell, a serialized post-apocalyptic drama about small town life on a network known for shows like CSI: Miami that are as successful as they are terrible (that is, very). The sight of a mushroom cloud rising from a picturesque Midwestern landscape was enough to pique viewers’ interest for a while, but an extended midseason break effectively killed the show’s momentum. Its modest ratings paled in comparison to those of the network’s generic detective yarns, and it was quietly cancelled after its first season finale aired. When the peanut stunt bought the show an abbreviated second season, it had already begun to shift from a survivalist drama to a paranoid thriller about a second American Civil War. The first 10 minutes of season two tells us more about the larger political dynamics of post-nuke America than the whole of season one. The weak vestiges of the United States have regrouped in Columbus, Ohio, but they’re completely dominated by the ruthless, corporate Allied States, based in Cheyenne, Wyoming. The swing state is Texas, but they’re close to aligning themselves with the Allied States. The tiny town of Jericho holds the only evidence of the greatest crime ever committed, a lone bomb that the shadowy black ops agent Robert Hawkins (British star Lennie James) failed to detonate when he had second thoughts about participating in the bloodiest coup in human history. Those who dislike serialized TV often complain that the plot doesn’t move fast enough, that there’s too much wheel-spinning and not enough forward movement toward the inevitable conclusion. 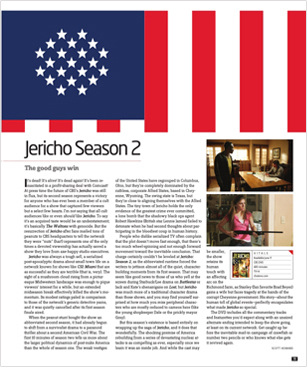 That charge certainly couldn’t be leveled at Jericho: Season 2, as the abbreviated runtime forced the writers to jettison almost all of the quiet, character-building moments from its first season. That may seem like good news to those of us who yell at the screen during Starbuck/Lee drama on Battlestar or Jack and Kate’s shenanigans on Lost, but Jericho was much more of a traditional character drama than those shows, and you may find yourself surprised at how much you miss peripheral characters who are mostly reduced to cameos here (like the young shopkeeper Dale or the prickly mayor Gray). But this season’s existence is based entirely on wrapping up the saga of Jericho, and it does that wonderfully. The shocking premise of America rebuilding from a series of devastating nuclear attacks is as compelling as ever, especially once we learn it was an inside job. And while the cast may be smaller, the show retains its human touch with an affecting arc on the Richmond farm, as Stanley (fan favorite Brad Beyer) gains a wife but faces tragedy at the hands of the corrupt Cheyenne government. His story – about the human toll of global events – perfectly encapsulates what made Jericho so special. The DVD includes all the commentary tracks and featurettes you’d expect along with an unaired alternate ending intended to keep the show going, at least on its current network. Get caught up before the inevitable mail-in campaign of crawfish or number two pencils or who knows what else gets it revived again.